Department of Botany, University of Kalyani, Kalyani 741235, Nadia, West Bengal, INDIA. Introduction: Paederia foetida L. is a climbing shrub that possesses several ethnomedicinal uses with immense pharmacologic relevance. Objective: The study aims to determine an efficient extraction condition for phenolic compounds with substantial antioxidant activity. Materials and Methods: Solvent (aqueous, methanol, ethanol and acetone) extracts were made from fresh leaves (FL) and shade dried leaves (SDL) of P. foetida with different durations (12, 24, 36 and 48 h). Quantitative estimations of all extracts were made for total phenolic content (TPC), total flavonoid content (TFC) and total tannin content (TTC) along with their total antioxidant activity (TAA). The phenolic contents of different extracts were correlated with their TAA. Extracts with highest phenolic yield and TAA estimates for each solvent were assessed by 2, 2-diphenyl-1-picrylhydrazyl (DPPH), 2, 2ˊ-azinobis-3-ethylbenzthiazoline-6- sulfonic acid (ABTS), superoxide (SO) and ferric reducing antioxidant power (FRAP) assays. Results: Methanol exhibited the highest extraction ability for TPC, TFC and TAA while aqueous extractions are superior for TTC. The maximum estimates of all the studied components are noted at 48 h. Mostly, extracts of SDL are superior to FL. TPC and TFC are interrelated between themselves as well as showed positive and significant correlation with TAA. 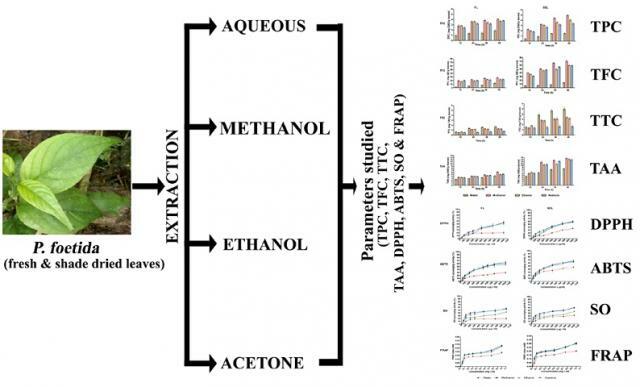 The antioxidant assays (DPPH, ABTS, SO and FRAP) reveal higher antioxidant activity with methanolic extracts compared to other studied solvents. Conclusion: The study highlights antioxidant properties of phenolics, particularly flavonoids in P. foetida, which can be further explored for its pharmacological importance. Ojha S, Raj A, Roy A, Roy S. Extraction of Total Phenolics, Flavonoids and Tannins from Paederia foetida L. Leaves and their Relation with Antioxidant Activity. Pharmacognosy Journal. 2018;10(3):541-547.